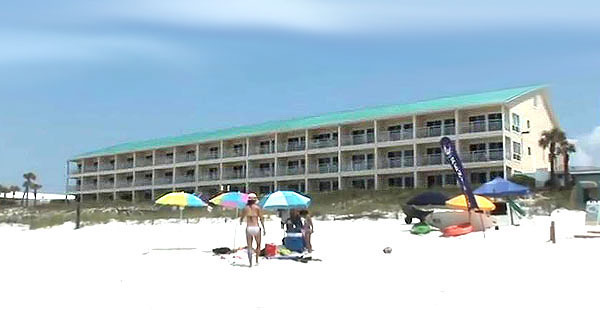 Crystal Sands is a beautiful beachfront three-story vacation condominium complex with an East and West building located on Scenic Drive in Destin. All have private balconies and direct views of the Gulf waters. Both sections have a pool, one heated in the cooler months. The pools have sundecks surrounding them with an enticing wooden boardwalk meandering down to the beach. Barbecue grills are handy for outdoor meals, and high-speed internet is available. Built in 1995, both are low-rise properties with three floors and a roof that matches the color of the ocean. In this part of the Gulf, the water is incredibly clear. You can find videos where dolphins and rays are plainly visible far out into ocean depths. This is why we call it "Crystal Beach." Ground and second-floor condos are one bedroom and face the pool, with two bedroom condos located on the third floor. Some of the two bedroom units also include a loft room often used as an office or third bedroom. Most have upgrades such as tile flooring, jacuzzi tubs, and granite counter tops. Prices range from around $350,000 for a one bedroom to just under $450,000 for a two bedroom two bath. 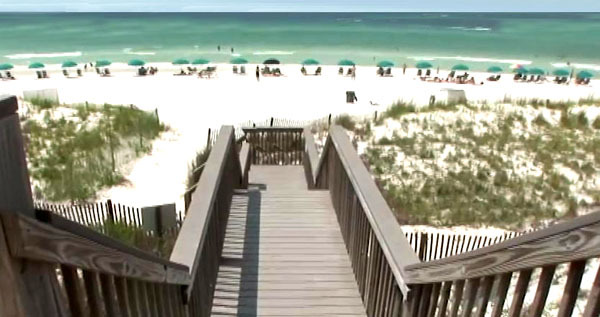 Destin's many restaurants and shops are nearby, such as Destin Commons and Paradise Key for groceries. You can shop until you drop and then have a fantastic meal at the Crab Trap or Beachwalk Cafe. The beach here is the best you will find, with miles of white quartz sand, umbrellas and beach chairs available in season. The Crystal Sands will appeal to buyers looking for a more private, quiet place at the beach, or even a year-round residence. If you would like to take a look at one of these oceanfront condos, call us for a Realtor to arrange tour or get more information.